We’d love your help. 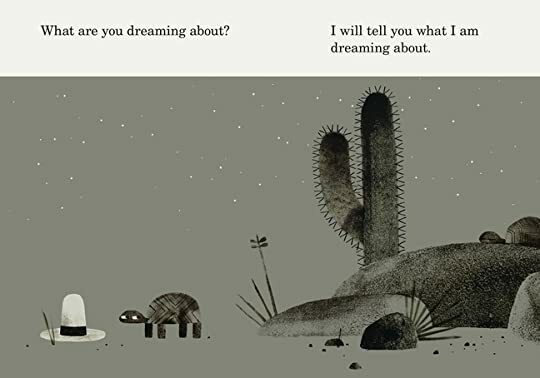 Let us know what’s wrong with this preview of We Found A Hat by Jon Klassen. Two turtles have found a hat. The hat looks good on both of them. But there are two turtles. And there is only one hat. . . . Evoking hilarity and sympathy, the shifting eyes tell the tale in this brilliantly paced sto Hold on to your hats for the conclusion of the celebrated hat trilogy by Caldecott Medalist Jon Klassen, who gives his deadpan finale a surprising new twist. To ask other readers questions about We Found A Hat, please sign up. Dawn They don't have to, but they are better if they are read in order. Is this a picture book? Erin Yes, it is the third picture book in Klassen's hat series. Genius in style and in substance (and in shifty eyes). A million stars. I think I need to read this book every night for the rest of my life, and eventually perhaps the mysteries of the universe and the human condition will be revealed to me. I'll start by reading it to my kids tonight and seeing what they say. Such a sweet ending to this trilogy of sorts, but with significantly less murder than I was expecting. Each year I and my family read and rate all the Goodreads picture book nominees. This one is nominated for 2016. I make a few comments and then add their separate ratings and a comment from each of them. There's 20 (15 first round and 5 new ones for the semi-final round) and this is the fifteenth being rated. My rating might be somewhat influenced by the family, naturally. This one is unique in that it is the only one of the 20 I had read well in advance of the award process. And so I will honor Each year I and my family read and rate all the Goodreads picture book nominees. This one is nominated for 2016. I make a few comments and then add their separate ratings and a comment from each of them. There's 20 (15 first round and 5 new ones for the semi-final round) and this is the fifteenth being rated. My rating might be somewhat influenced by the family, naturally. This one is unique in that it is the only one of the 20 I had read well in advance of the award process. And so I will honor my collective sense of this book as not as good as the first two and knock my own personal rating to 4 stars! Because maybe they (and GR friend Martyn) have talked me out of my rave. 5 Stars. Yay, yet another hat book from Jon Klaasen, the third in a kind of trilogy! This one is in three parts, which is unusual for a picturebook. Two turtles find a hat. One hat. They decide to leave it so no one will NOT have a hat. But turtle # 1 seems to REALLY want it. It would appear that #1 will, when the other one is asleep, finally take it, but. . . #2 shares a dream he has about their both having hats. Though there are not two hats. So the ending is either just strange, weird, or it has mystery about it. I say the latter. Most kid books have clear "morals." This one could be about friendship and sharing. It could be about how we must deal with a world of diminishing resources. And maybe it is about these things, or could be. I think it is just a little refreshingly off center, with some admission of longing and jealousy in it. And magic, with wonderful drawings. Check out Klaasen! Read everything he does! Lovely. Tara (my wife): 3 stars. Not as good as his other books. Harry (11): 3 stars. The turtles are fighting to get the hat back. Hank (10): 2 1/2 stars. Lyra (9): 4 stars. I like how one turtle wants the hat without sharing. We read "We Found a Hat" in 2016 and I was amazed at how much children loved his turtle illustrations. They're so simple and can be recreated on paper by very young children. We love Jon Klassen's illustrations and stories. I love to see children inspired by books like these. They're unique, simple, and wonderful. 2.5 stars. Good artwork, really cute turtles, lovely colours. We found the text quite boring. 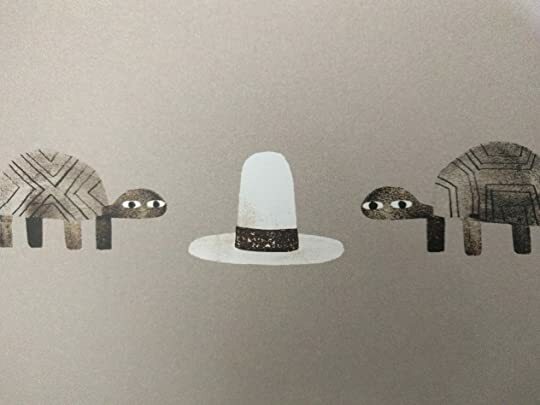 This is a children’s picture book about two turtles who come across a hat. They both look good in the hat, but the complex maths involved in dividing one hat between two turtles creates a resource scarcity dilemma that could end in betrayal. This tale serves as a beautiful and stark illustration of every human confrontation ever, from family squabble to global war, since the dawn of mankind. I have an unreasonable amount of love for this simple story. It started on the first two pages. And I loved it all the way through to the end. Also, this is the mascot of my mind, representing the bulk of my feelings: side-eyes and plotting. First sentence: We found a hat. We found it together. But there is only one hat. And there are two of us. Premise/plot: Jon Klassen is very, very, very, very, very popular. But he has a very, very, very, very, very odd sense of humor. This is the third 'hat' book. (Three picture books with 'hat' in the title. But different characters, different hats, as far as I can recall.) This picture book is about what happens when two very good friends want the same hat. My thoughts: Well, I'll be honest. I First sentence: We found a hat. We found it together. But there is only one hat. And there are two of us. Absolute perfection. In this book you'll find: a hat, cacti, friendship, side-eye, dreaming, turtles in space. Shockingly sweet . . . I fully expected the turtles to turn murderous, but it went in a very different direction! A lovely ending to Klassen's "hat" trilogy! 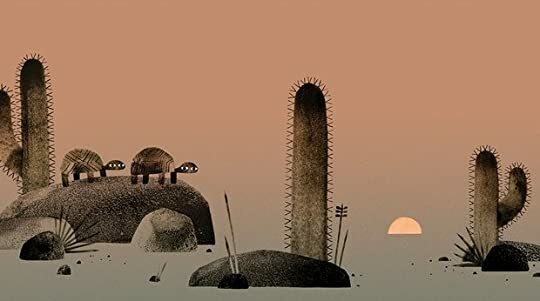 Recommends it for: Fans of Jon Klassen's Hat Series! I have to say that this was the year that Jon Klassen’s “Hat” series has really amazed me and I was lucky enough to read all of Jon Klassen’s “Hat” books all at once! 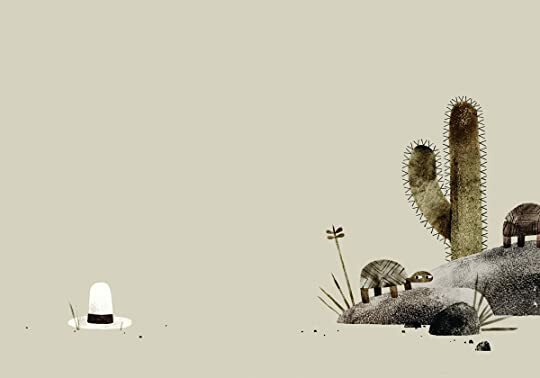 Jon Klassen’s newest “Hat” book “We Found a Hat” is actually an interesting departure from the usual antics of the “Hat” series that made me chuckle along the way! The story starts off with two turtles finding a hat and when they both tried the hat on, the both looked good in it. Unfortunately, there is only one hat and only one of the turtles can have the hat. How will the two turtles solve this problem? 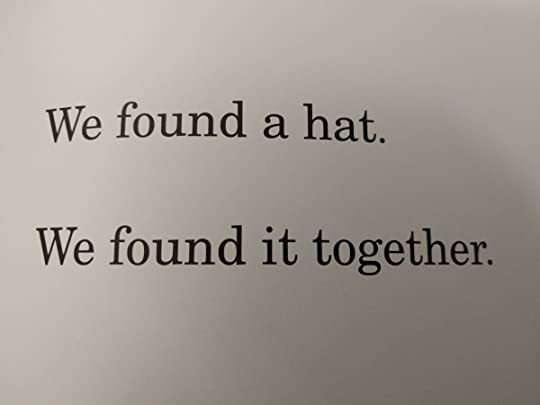 Ever since I had read “I Want My Hat Back,” I continued reading Jon Klassen’s books and even though “We Found a Hat” was not as dark as Jon Klassen’s previous works regarding the “Hat” series, I still found myself enjoying this unique spin on the importance of sharing! I loved the fact that Jon Klassen made this story much lighter in tone than his previous works as it made the book quite unique in the “Hat” series and I loved how this book does not focus on stealing (although a couple of scenes depicted one of the turtles nearly doing it), but focuses on the dilemma that the two turtles face in having to figure out who will get the hat. I was also chuckling to myself when I saw the scenes where one of the turtles was planning on taking the hat and you can see the turtle sneaking up on the hat while the other turtle’s attention was away, as it was hilarious to look at and it shows that despite being lighter in tone than the previous books, it still has the same deadpan humor that was relevant in the previous books. Jon Klassen’s artwork is as usual deadpan yet comedic as most of the colorings of the artwork are in brown, white and black, which gives off a somewhat mundane feel to the story. I also love the images of the turtles themselves as they are extremely cute to look at with their small bodies and large and narrow eyes! 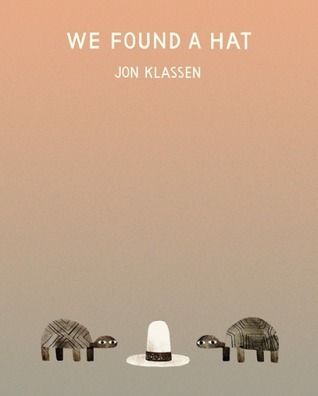 Overall, “We Found a Hat” is a brilliant subversion to Jon Klassen’s previous “Hat” books that fans will take delight in and anyone who enjoyed reading “I Want My Hat Back” will surely enjoy this book! There is something so special about reading a book for the first time. One that has high expectations, that you've waiting for for awhile. That first reading experience is one you can never have, in that way, ever again, with that book. Because of that, I'm not going to write a review for this book. Enjoy your own first experience with the final book in this trilogy. نقاشیهای سادهای که عمق احساسات رو نشون میدن. و خواب و ستاره ها! نقاشی‌های ساده‌ای که عمق احساسات رو نشون میدن. This simple children's picture book is beyond brilliant. The moral of the story, presumably the last book of the three hat books, is epic. Everyone could benefit from a quick perusal. "We both have hats?" Yes, yes, yes. Way too many sad, poignant adult truths in here to be appropriate for children. Getting it for my friend's baby shower anyway. "Two turtles have found a hat. The hat looks good on both of them. But there are two turtles. And there is only one hat..."
Okay so my nephew and I didn't know this was the last book in the hat trilogy told by Jon Klassen... But you know you didn't need to read them in any order. We QUITE enjoyed this book. My nephew LOVED how the book ended with them walking into the sky. He comprehended what happened through the book, not something he is always able to grasp... and was able to tell me all about the turtles who loved the hat. The words were spot on. He didn't struggle with the words at all which I think helped a lot with his comprehension, but at the same time this wasn't dumbed down for children. The story is literally SHOWN instead of told... and there is a subtext like you wouldn't believe! For example, at one point the two turtles sit and watch the sunset. One asks the other what they are thinking about... only through the eyes do we realize that the one asking the question is thinking about something else and it isn't in the sky! The art has its own particular style. It isn't my favorite as I favor bright colors and this is distinctly monochromatic. At the same time it is quite gorgeous how he used the ink for the turtles and the setting while using the light grey, pink and dark grey to evoke the evolution of the day... I have to say he won me over to the style... in another hands this would just be a cheap way of printing. I also love how some spreads are zoomed in on the turtles and some are more panoramic depending on what the dialogue needs most. So smartly drawn... it deserves an award! This review has been hidden because it contains spoilers. To view it, click here. We were so sure we knew where this was going. The two turtles find one hat. They both look good in it, but they can't both have it. What to do? Well, obviously it's going to be a lesson in sharing, isn't it? They can take turns. Instead, they both renounce the hat, then dream they both have hats. Which for me feels uncomfortably close to the life-rejecting strain of religion in which you forego hats (or other pleasures) now, and in exchange get hats (or whatever) in some nebulous other wor We were so sure we knew where this was going. The two turtles find one hat. They both look good in it, but they can't both have it. What to do? Well, obviously it's going to be a lesson in sharing, isn't it? They can take turns. Tremendously witty. Simple and repetitive in language and image, yet absolutely riddled with complex feelings to discuss such as guilt, jealousy, honesty and dishonesty. The book is split in to three sections, which could provide three very different sessions when working with children. They act as natural resting points or discussion points. A good book for highlighting friendship and being kind to others, as well as knowing the self. Anyway - cute story with an Awww! ending. Yes, I AM counting this delightful picture book towards my reading challenge. Professional development. Just try and stop me. It actually took me a little while to get into Klassen until I realised that he was being far cleverer than I was giving him credit for. I wouldn't be surprised if he is another writer who says he's not writing with children in mind. Without giving anything away, let us instead celebrate Klassen's form. Set in the desert, among the stars and thorny cacti, the structure of the book follows that of those early black and white films, split into several parts ( which I just loved). The positioning of It actually took me a little while to get into Klassen until I realised that he was being far cleverer than I was giving him credit for. I wouldn't be surprised if he is another writer who says he's not writing with children in mind. Without giving anything away, let us instead celebrate Klassen's form. Set in the desert, among the stars and thorny cacti, the structure of the book follows that of those early black and white films, split into several parts ( which I just loved). The positioning of the text (or lack of) is masterfully handled and is key to the comedic, reflective timing. Then, as with all Klassen, the beauty is in the detail, or more specifically, in the eyes. It's all the eyes! This book was SO SWEET. I almost teared up at the end. Simple words, not to many for a beginner and the artwork was simple and direct. The story was simple, but full of meaning. 5, completely recommend, stars! We found a book my daughter and I. The pictures are nice we smiled not cried. There was only one but decided to share. I read some to her she read some to me. We left with some books and smiled with glee. Jon Klassen precisa ir ao um psicólogo pra descobrir porque todos os seus livros são sobre ganância. Charming and poignant. 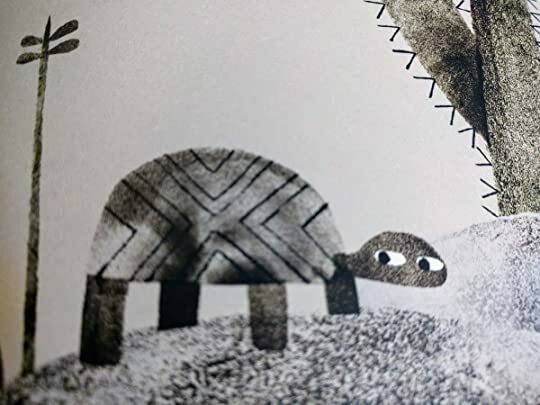 Deceptively complex ideas run under the surface of this wonderfully illustrated story about two turtles who find one hat. I LOVE THIS!!!!!!!! So adorable. Again I'm left in tears by Jon Klassen's work. Also apparently I ❤ Jon Klassen. That is all. I ❤️ turtles. Also apparently I ❤️ Jon Klassen. Another thoughtful picture-book from the quill and graphite of Mr. Klassen. I'm not sure what to make of the moral of the story, however. Although Morally Ambiguous Covetous Left Turtle gets schooled by his partner in restraint and self-respect, Ethically Unreliable Abstemious Right Turtle gives his lesson through conscious deceit. Maybe there is a reference to one of the great allegories here? Can a friend, wiser than I, tell me if this is an old lesson in a modern wrapper? Or maybe my midcentury Another thoughtful picture-book from the quill and graphite of Mr. Klassen. Maybe there is a reference to one of the great allegories here? Can a friend, wiser than I, tell me if this is an old lesson in a modern wrapper? Or maybe my midcentury middleclass middle-America morals merrily missed massive mastery of a great ethical lesson. Can a friend, more righteous than I, tell me if a 4-to-6-year-old ISN'T going to walk away thinking (erroneously!) that the end justifies the means? About four years ago, I loved "I Want My Hat Back," a book in which a big bear beats the stuffing out of a little rabbit to get his hat back. It was a great book, darkly funny and amusing. Expecting the same from "We Found a Hat," I was caught off guard. This book starts off sly and funny, as two turtles find one hat that they both look equally ah-mazing in. But the story evolves into a touching tale about finding what is truly important in life and going with it. 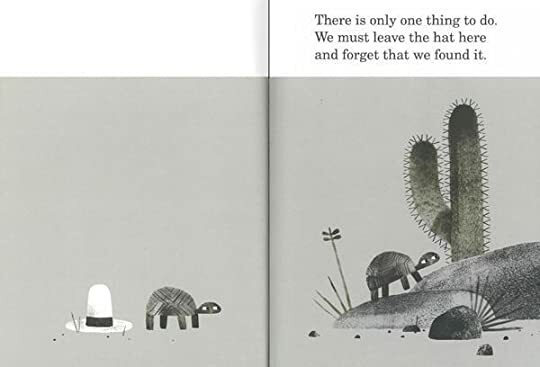 The final page is so beautiful, About four years ago, I loved "I Want My Hat Back," a book in which a big bear beats the stuffing out of a little rabbit to get his hat back. It was a great book, darkly funny and amusing. I LOVED THIS SO MUCH. Jon Klassen brings his signature humor and illustrative rumination on the darkness lurking in all of our souls, but it has a surprising (for him) sweet ending. I gave this to my husband for his birthday because he loves the other hat books, and this kind of humor is right up his alley. Also, the Strand has matching Klassen gift bags, so get in there. Also. Y'ALL. What if the "hat" is really EQUALITY and FREEDOM, and until we are all free, none of us wear the hat???? Sista delen i Jon Klassens hatt-trilogi. Ett av mina första minnen av solidaritet är när jag var kanske 10 år gammal och jag och Nils Johansson cyklade till stranden (vilket var någon mil att cykla). Jag ramlade och rev upp hela min tröja så att den inte gick att ha på sig längre. Vi fortsatte cykla och efter ett tag drog Nils av sig sin tröja och slängde iväg den. Denna bok påminner mig om det minnet, litegrann. My favorite of Klassen's "Hat Trilogy." Two turtles find a hat. They both look good in the hat, but there's only one, so they leave it where they found it and move along. Slowly, of course. Nefarious thoughts ensue, of course... but will they act on them? You'll enjoy reading this one aloud and having your kiddos interpret and infer what's going on behind those turtles' (not blue, but exceedingly expressive) eyes. Awwwww, Jon. You sweet devil. 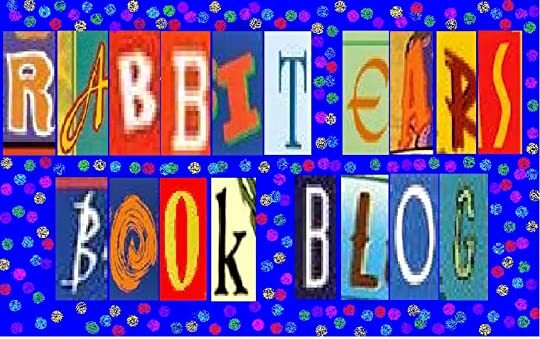 Click HERE and watch a read aloud. I enjoyed this title more than This is Not My Hat, perhaps because of the ending... And the turtles' eyes--wow Klaussen can capture an extraordinary range of emotion with so little a change (a faint squint for deliberation, a dilation of the pupil for sleepiness...). I have not encountered an author in a good while who captures feeling, relationships and hard choices as simply and elegantly. We Found a Hat is cute and awesome and fun! It reminded me of I Want My Hat Back . This one may not have been quite as hilarious, but it had a lot of heart. At least I thought so. Estaba en la librería con mi hermana y lo encontramos de casualidad. Se me olvidó añadirlo a mis libros de 2016 porque solo necesitamos un par de minutos para empezarlo y terminarlo, pero instantáneamente se ganó un pequeño sitio en nuestro corazón. Jon Klassen received the 2010 Canadian Governor General’s Award for his illustrations in Caroline Stutson’s CAT'S NIGHT OUT. He also created illustrations for the popular series THE INCORRIGIBLE CHILDREN OF ASHTON PLACE and served as an illustrator on the animated feature film Coraline. I WANT MY HAT BACK is the first book he has both written and illustrated. Originally from Niagara Falls, Canada, Jon Klassen received the 2010 Canadian Governor General’s Award for his illustrations in Caroline Stutson’s CAT'S NIGHT OUT. He also created illustrations for the popular series THE INCORRIGIBLE CHILDREN OF ASHTON PLACE and served as an illustrator on the animated feature film Coraline. I WANT MY HAT BACK is the first book he has both written and illustrated. Originally from Niagara Falls, Canada, he lives in Los Angeles.